What does a gunsmith do? Would you make a good gunsmith? Take our career test to find out how you match with this and over 800 other careers. What is the workplace of a Gunsmith like? A gunsmith is someone who takes guns that aren’t working and puts them back together properly, replaces parts to bring back functionality, modifies them to perform a specific task, or works from scratch to make an addition to a firearm or a completely new firearm. Essentially, they return guns to their original condition to ensure proper function, safety and appearance. Gunsmiths may also apply engravings, carvings, and other decorative features to an otherwise finished gun. They work closely with the public and try to meet individual customer's requests. Ensuring that guns work and function safely is the primary technical responsibility of a gunsmith. They strictly observe gun safety handling procedures, and also ensure safe mechanical operation of the gun. They assess the firearm, determine where the shortcoming or failure is originating from, repair any deficiencies and bring the firearm back within specifications. Often, the part malfunction or safety concern is often hard to see with the naked eye or is so small that it has to be systematically determined. A lot of the work that general gunsmiths do involves metalwork, wood work, fabrication and parts fitting, and to a smaller extent large machine work like lathe turning, milling or drilling operations, grinding, sandblasting and other material preparation as well as chemical work. Custom Gunsmith Builder/Designer These gunsmiths build guns from raw materials and shelf parts to meet their customer's specifications. They often do custom work for professional target-shooters, sports shooters, or anyone that wants custom features added to their firearm. They also build firearms for hunters and shooters that want more than what is offered by standard gun manufacturers. They work with engravers and other artists to produce unique finishes and decorations. However, some highly skilled gunsmiths can complete all firearm modifications without anyone else in the industry helping them. Finisher These gunsmiths apply chemical processes (like browning, bluing, Parkerization, etc.,) to develop corrosion resistant surface layers on the steel part of the gun, and may also apply case hardening (a combined chemical and heat-treatment process) to low carbon steel parts. This results in a thin, very hard surface layer with a tough, malleable core. This process can introduce rich colours into the carbonized surface, known as colour case hardening, and is prized for its rich mottled blues, purples, browns and grey tones. The coloured surface layers are subject to wear and may also fade with time. Renewing this colour case hardening to the specific patterns of the firearm when it was new has become an important sub-area of the gunsmithing field. Stockmaker These gunsmiths carve gun stocks from wood (usually walnut is used; but sometimes birch, maple, and apple wood is used). They fit stocks to the metal parts of the gun as well as to the customer's body dimensions. The fit is vital with custom made shotguns, as the shot cloud's impact is largely determined by the way the stock fits the shooter. This calls for a very high level of skill and craftsmanship, as the finished product must be visually pleasing, fit the shooting customer perfectly, and be able to withstand high levels of recoil from firing many thousands of rounds. Wood gunstocks may be fashioned with automated machinery while high end gunstocks are hand made using saws, chisels, gouges, rasps, and files, and finished by sanding, scraping, staining, oiling, or lacquering. Checkerer These gunsmiths use checkering tools to create an ornate pattern of small raised diamonds in the wood surfaces which are to be gripped. Tiny saws designed to leave a v-shaped groove (of approximately 60 to 90 degrees) in the surface of the wooden gunstock are used. The area to be checkered is covered by one set of grooves parallel to each other. A second set of parallel grooves is then executed across the first set, at approximately a 30-degree angle, leaving the area covered with small, pointed diamonds. Gun Engraver These gunsmiths use hand-powered tools to engrave metal. They use hand-gravers or die-sinker's chisels to cut designs or pictures into the metal surfaces of the gun. The gun engraver must first be an artist that can come up with the desired design freehand on paper, and must have a thorough knowledge of human and animal anatomy, perspective, botany, and composition. The size and geometry of the parts must also be considered, and harmony between all these factors must artistically agree. Typically, the customer must be consulted and must approve the design. The design must then be cut freehand into the tough hardened steel surfaces of the firearm. Other metals (such as gold and silver) may be inlaid and engraved to further the design. Designs usually consist of scroll-work, or may be of purely abstract spirals. Top grade engraving is very expensive. However, tastefully designed engraving always adds significantly to the value of a firearm. Pistolsmith These gunsmiths work on pistols and revolvers, and are proficient in a range of skills such as woodworking, checkering, machining, metal finishing and metalworking. Often a pistolsmith is called on for the customization of a handgun making it better suited for its intended purpose. Standard model target pistols can receive extensive reworking by skilled pistolsmiths resulting in greater accuracy than the standard versions of the same arm. A pistolsmith may also construct a completely hand fitted target arm using a serial numbered frame as the base. Specialist manufacturers supply parts possessing excess metal in certain areas so the pistolsmith can fit these parts together to exacting tolerances. The pistolsmith can then build extremely accurate firearms that exceed the usual accuracy of standard models of the same model. Some pistolsmiths only work on one or two types of manufacturers pistols, while the more highly trained pistolsmiths will work on more. (Niche) Gun Manufacturer These gunsmiths use their experience and skills to become small-operation manufacturers, specializing in making only a few types of gun parts. Some of the more important part categories are barrels, trigger assemblies, receivers, and locks. Are you suited to be a gunsmith? Gunsmiths have distinct personalities. They tend to be investigative individuals, which means they’re intellectual, introspective, and inquisitive. They are curious, methodical, rational, analytical, and logical. Some of them are also enterprising, meaning they’re adventurous, ambitious, assertive, extroverted, energetic, enthusiastic, confident, and optimistic. Does this sound like you? Take our free career test to find out if becoming a gunsmith is right for you. As a general gunsmith, one could expect a large majority of time to be spent cleaning, disassembling, and examining all types of guns, and then performing minor parts replacement and obvious, straightforward repairs. 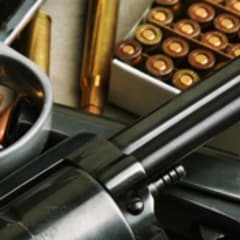 Gunsmiths may be employed in factories, by firearms manufacturers, armouries, military or law-enforcement agencies, sporting goods stores, or small gunsmith shops. Most gunsmiths work a regular 40 hour work week. However, If a gunsmith is trying to restore or repair a gun for a customer that has a deadline, some overtime may be required.